Do you want to know how tall should a tripod be? This article will give you a real simple formula first, but there's an important warning you need to know about too. The simple guide to the right tripod height is followed by more detailed thoughts on everything you need to consider about the right height for your camera tripod. Your Eye Level - (minus) viewfinder height - (minus) tripod head height = correct tripod height. Measure the height of your eye level. Subtract the level of your tripod head (if you are buying a head and the legs separately). Your answer is the maximum tripod height needed. (Including legs and center column extended). That's the simple formula to calculate the maximum height your tripod must reach, but... Houston, we have a problem. Your stability will be compromised at its maximum height. Sometimes a simple formula like this doesn't give you the complete story. Just using this equation on how to calculate the right tripod height for you gives you the absolute minimum required height for you to able to stand up straight when you're shooting. There is one more very important thing to consider. Raising your tripod legs and center column to its maximum height won't give you the best stability. 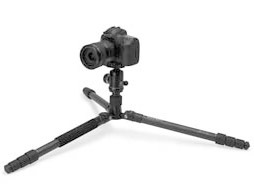 In fact, raising your tripod legs, and even more importantly your tripod's center column to their fully extended position gives you the least possible stability. Here are some tips on getting the most possible stability out of your tripod. The mathematical answer above is oversimplified, but it's a good starting point. 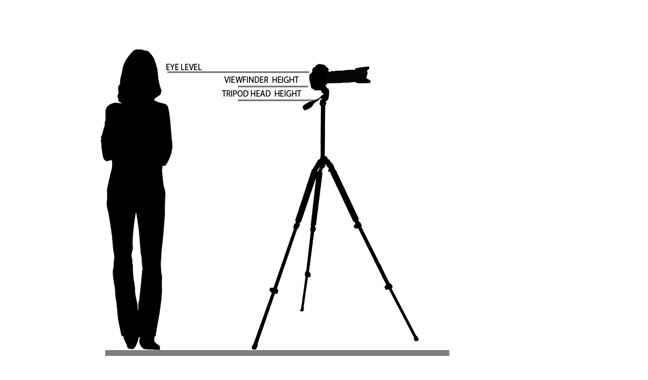 There are more factors to use than simple math when choosing how tall your tripod should be. 1. 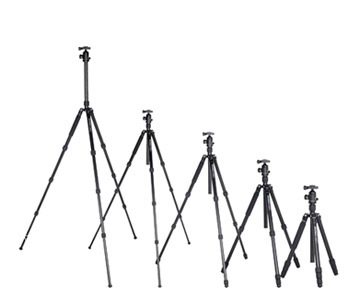 Tripods lose stability when they are fully extended to their maximum height. with the center column fully extended. Up away from the intersection of the three legs, your camera becomes more susceptible to movement, almost acting like a monopod. Buying a tripod that is just high enough with the center column fully extended may disappoint you with its performance. This is even more true if you are looking at cheap tripods in order to save money. Here is a short video on what is a good height for shooting portraits. There are no sample photos, but the narrator gives you some really good ideas. Watch how shaky the tripod looks when the actor raises up the center post: YouTube Video-Tripod Height and Portraits. 2. Minimum height photography. Do you ever shoot macro photos? If your tripod has a long center column, it will get in the way when you are trying to shoot objects at ground level. Tripod without center columns are harder to adjust for height, but they are much more stable to use than tripods with the center pole extended upward. 3. High perspective photography. What about shooting from above your subject? 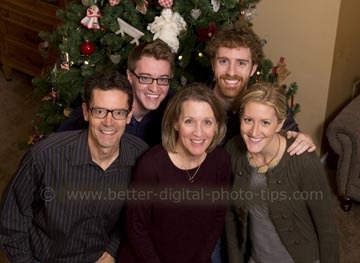 Taking a group photo from a high perspective can simplify the background and emphasize eyes and faces in a portrait. You need a tripod that can get much higher than your subject. 4. How heavy is your tripod? Taller tripods weigh more. If you need a travel tripod or want to carry your tripod on hikes you may have to sacrifice some height for easier portability. Shorter tripods may suffice if you are not shooting a whole bunch of photos. You won't break your back, bending over forward continuously, if you are only shooting a few photos. Low tripods are great for shooting close-ups in nature and photographing small children on their level. What about high level photography. When does it make sense to shoot from higher levels. 1. High perspectives. Architectural views can be more interesting. You can eliminate the horizon or simplify the background when shooting downward. 2. Shooting in a crowd. You may need a stool to stand on, but a tall tripod comes in handy when you are behind a crowd of people. 3. Shooting on a downward slope will mean you are at a slightly higher elevation than your tripod. 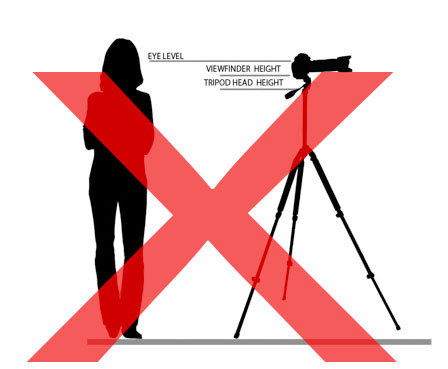 You may need a taller tripod because its legs are at a lower elevation than your feet. 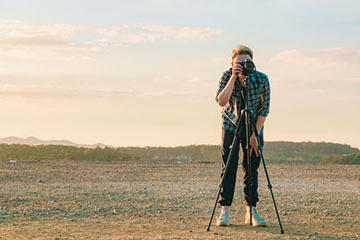 If you're in the market for a new camera tripod, there's more to consider than just how tall a tripod should be to reach eye level. If you don't mind bending over for an occasional use of a tripod, you can save on weight and price by going a little small. The maximum height a tripod goes to is just one consideration when choosing the best tripod. If you are only using a lighter point and shoot camera, there are plenty of checaper plastic tripods that might be okay for you. Take just a second to realistically think about how you will be suing your tripod first. Then do a little more investigating. A great place to educate yourself on all of the issues related to choosing a tripod is a review site. No, not the review sites whose chief interest is selling you THEIR favorite.